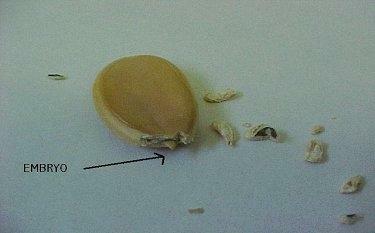 Embryo: Very small piece of tissue inside seed coat at very tip of the seed. Forms the radicle. Endosperm: Majority of tissue inside seed coat that provides energy for developing roots. Eventually forms the cotyledons of the emerging plant. Radicle: Little white growth that forms at the tip of the seed; essentially the first root. 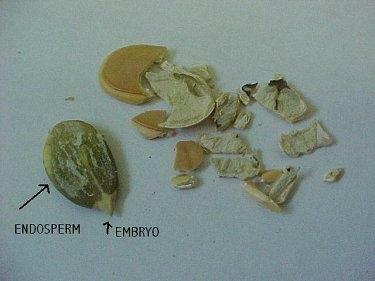 Nature designed seed coats to protect the embryo inside. Therefore, they are almost 100% closed off to the outside world. It takes a long time for the water to penetrate the coat, and activate the process of cell division. That is why many growers will file their seeds. The basic premise of this method is to maximize exposure of the embryo and endosperm to moisture and heat, and jumpstart the cell division process as quickly as possible. This is accomplished by completely peeling off the seed coat. STEP 1. Grab a seed. CAREFULLY begin chipping off tiny pieces of the coat from the tip of the seed. Use your fingernail. STEP 2. Continue chipping away small pieces until the tip of the embryo is exposed. Do not damage the tip of the embryo. This will prevent any chances of the seed germinating. STEP 3. When you have cleared the area around the embryo tip, you may choose to use a tweezers or fingernail clipper to finish removal of the seed coat. Be careful not to damage the endosperm, as these will form the cotyledons of the plant. STEP 4. Place naked seeds on wet paper towel inside a Ziploc bag. Make an effort to ensure contact between the wet towel and embryo tip. STEP 5. Store Ziploc bag in a warm spot, such as a computer monitor or refrigerator top for 24 hours. EDITOR'S NOTE: Putting wet or moist items on your computer monitor can cause a fire or damage your monitor. Please use an alternative heat source. Some people use a large cooler with a light in it. STEP 6. If you sandwich the seeds between two towels, remove the top one slowly. The radicles are very fragile. Transfer seeds with radicles to potting medium, and watch'em grow! This method works great for those who suffer from tragic disasters early on in the season. Using this method, I had radicle formation in less than 24 hours inside the bag. After planting, the seedlings were out of the soil in 3 days. Another benefit to this method is that the plants suffer no cotyledon damage. None. No mangled leaves, no seed coat to carefully remove after emergence.